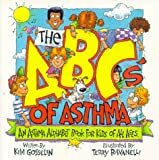 Seven Books for Kids with Asthma - a "Best Book List"
I read all of these books as an adult. I have had asthma and allergies since I was a child, and they didn’t have books like these then. It’s hard having asthma at any time of life, but especially when you are a child. These titles would have made a world of difference in my acceptance at not being able do some of the things my friends did. Aaron has allergies and because of this he has to find new homes for his pets. Each letter of the alphabet is associated with a word that has something to do with asthma. Brianna is the lead in a school play, and she can't catch her breath during the dress rehearsal. After going to the hospital she is diagnosed with asthma. The illustrations in this story of an allergic cow are really sweet. This book lets children know that it isn't someone's fault that they have a disease. I also liked the tips for teachers and kids. This is an adorable story. A little boy has to go to the doctor to get tested for allergies and afterward he and a friend go to the zoo. The zoo trip turns into a scavenger hunt of sorts for dander, fur and other allergy triggers.